From sand in your toes to a statement piece on your finger, Holly Daniels Christensen's custom cocktail ring keeps you reminded of your happy place. 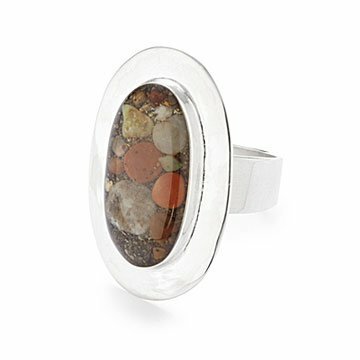 A sterling silver bezel displays a pinch of granules gathered from your choice of thousands of beaches around the world. Select your favorite from the artist's Sand Bank, or send in sand you've collected from an unforgettable spot. Handmade in Massachusetts. Click here to see a list of available beaches in Christensen's Sand Bank. You can polish your ring with a silver polishing cloth then use a soft cloth or brush with soap and warm water to remove the polishing residue. If the "sandy" part of your ring becomes scratched or cloudy, buff with car or boat wax.